In the early morning hours on Monday July 23rd the Hercules 252 rig blew out, spewing a mixture of gas, condensate, and possibly other hydrocarbons into the water and air. In four days, senior scientists – members of five Gulf of Mexico Research Initiative (GoMRI) consortia – assembled a team and plan, obtained the RV Acadiana, prepped and shipped equipment, traveled to Cocodrie, LA, sailed to the blowout site, and began their work to assess potential impacts. Five students – Joy Battles (ECOGIG), Nathan Laxague (CARTHE), Conor Smith (CARTHE), Tiffany Warner (CWC), and Sarah Weber (ECOGIG) – suddenly found themselves at the heart of this important mission, and not as sideline players. Their educational and research background and their personal fortitude were put to the test, working as a full-fledged response team to plan and execute this “herculean” data-gathering operation. Joy Battles conducts research for the ECOGIG (Ecosystem Impacts of Oil & Gas Inputs to the Gulf) consortium and is a member of the Joye Research Group at the University of Georgia. There, she is pursuing a M.S in Marine Sciences where she also received a B.S. in Microbiology and Psychology. Nathan Laxague conducts research for the CARTHE (Consortium for Advanced Research on Transport of Hydrocarbons in the Environment). He is pursuing a Ph.D. in Applied Marine Physics at the University of Miami’s Rosenstiel School of Marine and Atmospheric Science and received a B.S. in Physics at University of Miami. Conor Smith conducts research for the CARTHE (Consortium for Advanced Research on Transport of Hydrocarbons in the Environment). He is pursuing a Ph.D. in the Applied Marine Physics Department at the University of Miami’s Rosenstiel School of Marine and Atmospheric Science and received a degree in Physics with a concentration in Meteorology from the College of Charleston. 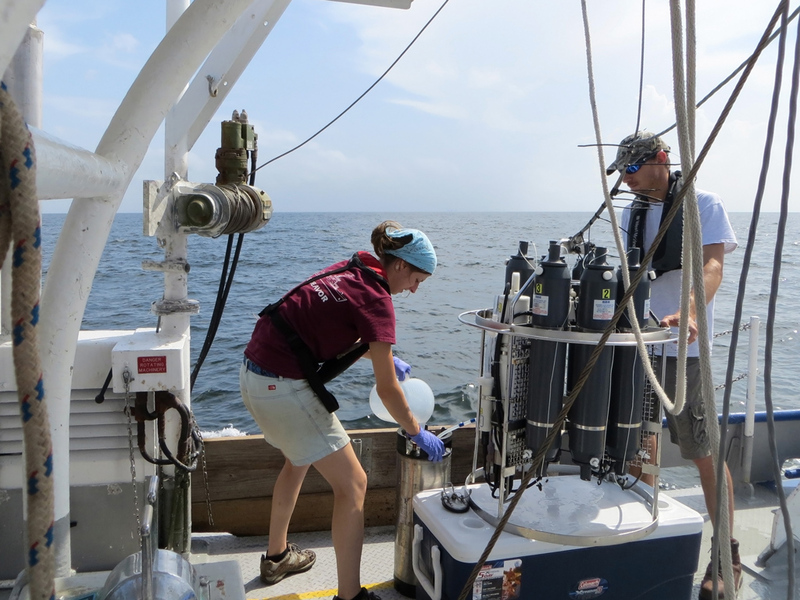 Tiffany Warner conducts research for the CWC (Coastal Waters Consortium). She is pursuing a M.S. in Oceanography and Coastal Sciences at Louisiana State University and the Louisiana Universities Marine Consortium and received a B.S. in Earth and Environmental Science at University of New Orleans. Sarah Weber conducts research for the ECOGIG (Ecosystem Impacts of Oil & Gas Inputs to the Gulf) consortium and is a Research Technician with the Montoya research group at the Georgia Institute of Technology. She will begin her Master’s in Biology in the spring. Read more about the immediate response: Scientific Dream Team Conducts Rapid Response Research at Hercules Gas Blowout. 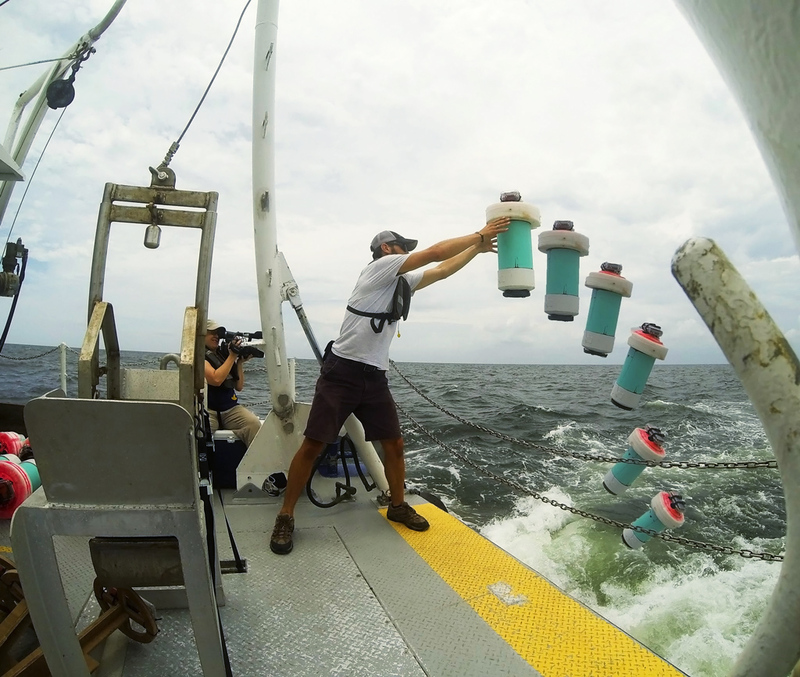 This research was made possible in part by Grants from BP/The Gulf of Mexico Research Initiative (GoMRI) to CARTHE, C-IMAGE, CWC, ECOGIG, and GISR. The GoMRI is a 10-year, $500 million independent research program established by an agreement between BP and the Gulf of Mexico Alliance to study the effects of the Deepwater Horizon incident and the potential associated impact of this and similar incidents on the environment and public health.